A large number of curious tourists visit the intriguing town of Ambalangoda to experience unique art forms which were very much part of the Sri Lankan cultural fabric decades before the invention of modern entertainment apparatuses. The town is well known for devil dancing employing masks; mask making and puppet shows highlighting significant aspects of local life and culture. To experience what Ambalangoda has to offer one should allocate a good part of the day, ideally with a tuk-tuk which can make its way through rough terrain effortlessly. Once in Ambalangoda you can see a few mask museums by the road where you can purchase masks which are handy take home gifts and souvenirs. Also, one can see the painstaking process of mask making where the skill is handed down from generation to generation. The Ariyapala Mask Museum is the preferred place to get a firsthand knowledge about various types of masks and their significance to the Sri Lankan culture. Another famous trait of Ambalangoda is devil dancing where masks are employed extensively to depict various demonic characters. Legend has it that exorcism is closely knit with devil dancing and Ambalangoda is famous for this. It may be possible to take in a traditional folk theatre performance (Kolanm) performed by local artists. 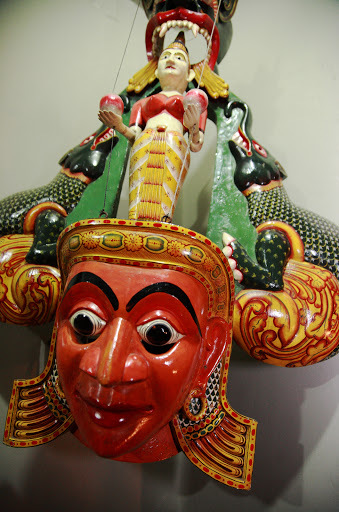 Ambalangoda is also famous for puppets. In Sinhalese it is coined as “Rukada” to signify a “puppet”. The carving of puppets is an ingenious skill confined to a distinct set of craftsmen. Puppetry is used for showcasing folk-drama locally referred to as “Nadagama”. It is believed that the word “Nadagama” originated from South India and has been adopted in Sinhalese. A kind of theatrical show which has influenced the traditional puppet plays in its form, style and presentation. Chaaya Trans Hikkaduwa is a beach hotel like no other which offers guests the personification of what a contemporary Hikkaduwa hotel should be. One of the best beach hotels in Sri Lanka, Chaaya Trans Hikkaduwa offers an idyllic getaway by the sea that comes with a variety of modern accommodation options and amenities that help make your stay all the more enjoyable and memorable. This entry was posted in Uncategorized and tagged Festivals, Mask and Puppet Shows in Ambalangoda by Pushpitha Wijesinghe. Bookmark the permalink.